Our fifth annual, 2013, Light the Winter Fires dinner auction was different on several levels. We held the event in mid- September instead of October. The event was held outdoors at the Bybee Historic Inn of Jacksonville. The format was casual with FUN being more of a goal in the fundraising. 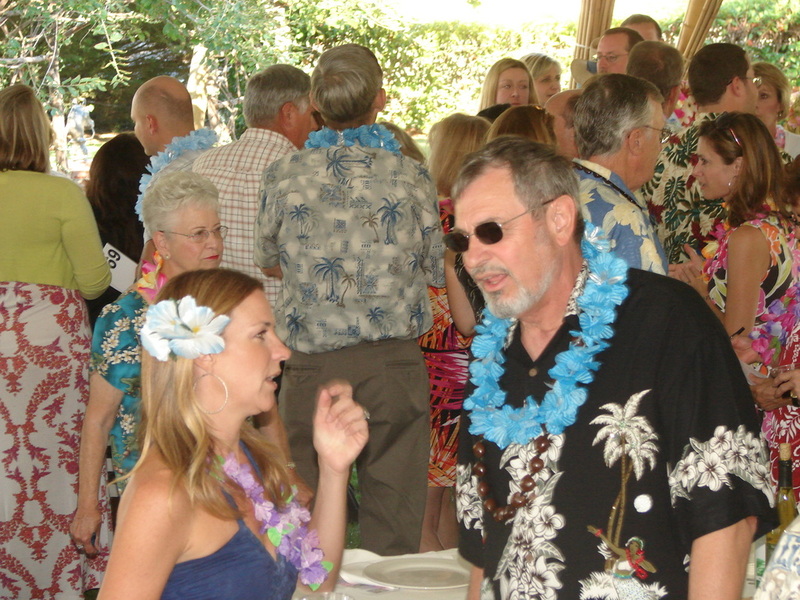 Oh yeah, the theme was a Luau (hard to be semi-formal with leis and Hawaiian shirts). From island music to late afternoon breezes, a grass floor to hula and fire dancers, Rosemary and Garth Harrington kept the fun and activities flowing with a rhythm only they have as emcees. If the volume and frequency of conversations during the initial social time was any indication of the mood of the guests, then it was obvious the festivities and good-times would last throughout the evening. The heads and tails ice breaker was well received, and the best Hawaiian shirt was recognized with a gift basket. 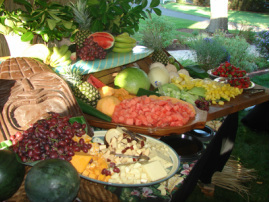 A delicious Luau dinner, by Ron Dunn, was enjoyed amid his wonderful island décor. 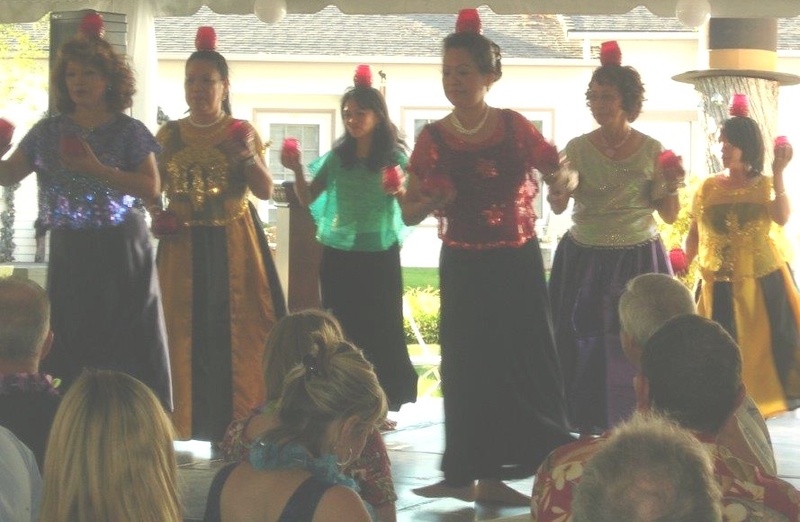 Delphine Peyton and her Hawaiian dancers, charmed those present with their hula swaying. Ali Aukusitino and her brother Mala performed a traditional Princess dance followed by Mala’s exciting and authentic fire dance. They all volunteered their time and performances for the benefit of us all and St Vincent de Paul. Len Hebert announced the recipients of the Annual St Vincent de Paul Len Hebert Humanitarian Award. Jerry and Jeanne Taylor were recognized for their long standing as supporters of St Vincent de Paul and as community leaders, benefactors and true humanitarians. Medford Councilman Bob Strosser shared the resolution by Mayor Gary Wheeler which declared Sunday, September 15th as Jerry and Jeanne Taylor Day. Then Rosemary and Garth went back to the mikes to accomplish the money raising portion of the evening as only they can, with effectiveness and plenty of humor. The winning bidders were critical to our fundraising efforts but we could not have done any of it without all those who donated the auction items and prizes. Mahalo to those who donated and attended. 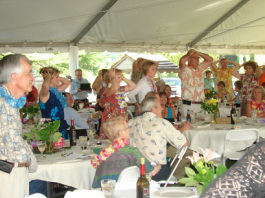 Mahalo, also, to Innkeepers Tina Marie and Vikki Lynn for providing the awesome venue of Bybee’s and a wonderful auction item, a stay at the inn. Jerry Basilicato of Tekmanagement and Vincentians Michael Morgan, Al Zon, Socorro Holloway, along with many others, including community bankers, friends and family helped to bring the festivities to completion. I must say the biggest and most deserved Mahalo to the Vincentians who met over numerous months and especially the last few weeks prior to the Luau dinner auction. Fran Davis-Cox, Susann Burke, Kathy Begley and Tedde Ridley and led by Len Hebert did the incredible job of finding a way to make this event a reality. They had a vision to make this year more enjoyable and festive than the past, and they succeeded with as much color as there was in all the shirts and dresses wore by those present. To all I say Mahalo, Mahalo Mahalo.